We were approached by several people wanting 8 metre trailer sailers. Each one had slightly different needs and priorities. As a result we currently have three different 8 metre designs under construction. The first commission we received was from Barrie O’Donoghue of Adelaide. Barrie was after an 8 metre which he could cruise around the coast and also do the odd rum race with his mates. We started with a hull shape developed from The 770 HPO design “Men in Black” built for Rod Jones (seen below) and developed this to carry more load and accommodation. 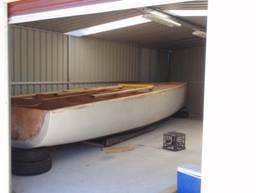 Some may have seen his articles in the Australian amateur boat builder magazine. 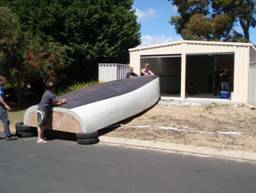 Unfortunately Barrie passed away before completing the boat but the project was picked up by Mike Unwin of Townsville. Mike appreciated the fine craftsman ship Barrie had put in to the Yacht and decided to purchase the vessel as a hull along with various bits and pieces. We had already completed a set of drawings for Mike who’s initial focus was cruising with the odd race. Since then he has been bitten by the racing bug and so we supplied modified drawings for the rig, keel and rudders to up date Barrie’s design for the predominantly lighter winds of North Queensland. Mike has just launched (March 2009) this boat called “Fuzzy logic”. A close friend Don Deem of Western Australia had built the prototype 550 design “X” a number of years ago and since moving to Perth had decided it was time for another project. Don was after an 8 metre with racing performance but with an interior to allow for coastal cruising. 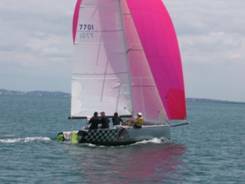 He didn’t want to have to race with a rugby team and wanted resale value and a usable boat after it’s racing life. The extreme sports boats such as the Thompsons just don’t have this. The challenge came when he wanted it only 2.3 metres wide. The result is a powerful hull quite different to Barrie’s/Mike boat. The distribution of buoyancy and placement of appendages reflect our latest thinking. The rigs in both these 8 metres are our current thinking which has been an on-going development started with the 550’s as are the foils. Another client Mr. & Mrs. Colin Smith of Buderim in Queensland liked the developments of the 8 metres but were after more headroom and maximum volume having had considerably larger vessels in the past. The result is a hull developed directly from Don’s boat but pushed out to the maximum beam of 2.50 metres. The rig is slightly more conservative but with more than enough to get her up and going. All of the above vessels are round bilged vessels built in strip planked Kiri (Paulonia). There displacements vary with the individual owners priorities from 1200kgs to 1500kgs. 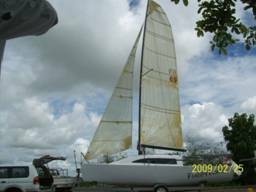 They are true cruiser racers capable of being sailed single handed and cruised comfortably but don’t under estimate their performance. We have developed several other designs including a single chined version designed to be built with a strip planked bottom and sheet plywood topsides and we are currently working on sheet plywood, multi-chined development. With our extensive knowledge and development of yachts in the smaller size range we have an excellent data base and can offer developments specific to our clients needs.